First of all I want to thank all of you for following . . . I think it is awesome that any ONE of you takes time out of your busy schedule to pop over and read what I write. . . so thank you. One of the most amazing thing I realized when I married Santa was this truth. . . some of the things I complained about my ex-husband doing . . . Santa did the same things. (Not everything, okay?) But there were a lot of things that my ex-husband did that totally INFURIATED me! Why did these same things NOT phase me when Santa did them? So many times I have heard women say their husbands really just need to be like this or that, or do more around the house. Why does this lady get to have a husband like THAT? Why can't my husband just listen to me? Okay? Really? I just think a lot of times (and don't misquote me) husbands get a raw deal. They share all their stuff with us, they work all the time . . . and sometimes all they want in return is a little peace (and sometimes a little piece too, LOL). Have you ever sat and listened to another couple's conversation. I was texting on my phone in front of Walmart last night (no signal inside . . .stupid Walmart metal roof . .grrr!) and a couple passed by. The woman was busily chatting away about somebody that she thought she recognized and thought this person recognized her. She had so much passion about what she was saying, as the man looked intently for the car, looked at their purchases, looked at people passing by, looked at the weird lady texting outside the store. The woman never raised as eyebrow to me to their direction or to their purchases. The woman needs to off-load the information or she will die! The man needs to navigate, serve and protect, or he will die! He doesn't have to listen to every single STUPID word that she says, he only has to pay attention to what she does. ie: not get run over, go to the right aisle where the car is parked, not be assaulted by some strange texting lady at Walmart . . . I blab away about this or that, whatever happens to pop into my little head, and I am grateful most of the time that Santa doesn't tell me to "hush". When what I AM saying is important, I make sure to get his attention. So I am trying to work on not blabbering away when I have nothing important to say. Notice I said I am working on it. . . .
Change one thing, just one thing about YOU and others around you will react differently. Hey, I'm just sayin' . . . agree or not, but leave a comment if you were here. I just loved this post... really!!!. I really had to laugh over the peace, piece part. Still laughing. I am a new follower from Friday Follow Over 40. Would appreciate it if you could stop by and follow back. I am giving a Mrs Santa Claus apron away to one of my followers on December 5. Oh... I forgot, I am following through google and networked blogs. I think your blog is really cute! 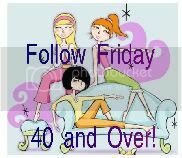 Im a new follower - found you on the Friday follow over 40 blog hop.